If you love salmon and the idea of cooking ingredients together on pan for an easy weeknight meal, this is the recipe for you. Salmon makes this a super healthy dinner; while the mixture of corn, tomatoes and oregano makes it one of the tastiest recipes around. Served with a side of quinoa or rice you have a well-balanced, healthy meal that is ready in minutes. Preheat oven to roast at 400 degrees F. Line baking sheet with foil and drizzle with olive oil. In a small bowl, whisk together olive oil, lemon juice, oregano, garlic, salt, and pepper. Reserve a small amount of this sauce for salmon. 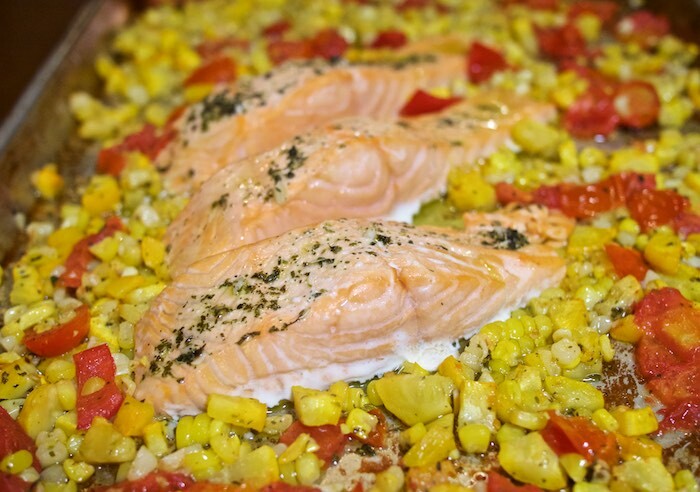 Toss corn and tomatoes with the rest of the mixture and place on sheet pan leaving a space in the middle for the salmon filets. Place salmon fillets on pan and drizzle with reserved sauce. Roast for 10 minutes. Remove pan from oven, stir vegetables and turn on the broiler. Broil salmon and vegetables for 3 minutes until the fish is brown on top. Remove from oven and serve. This looks like it would be a huge hit with the family! I love how easily it comes together. Yum! This looks great, I miss corn in the winter! Salmon is such a forgiving fish, I wish my family liked it as much as do. This looks healthy and delish! love salmom so much! I always keep my freezer stocked with it. One pan meals are my fav! Yum! I love healthy dinners, especially when it's this easy to make. One pan meals are the best! So yummy! We're big salmon lovers in my home. And I'm all about sheet pan dinners. I'm not a huge fan of salmon but I do love one pan dinners- so this would be delicious with chicken! Love a one oan meal! I was just saying to my husband today.... we need to pick up some salmon. These one pan meals are such a time saver on the busy weekdays. Delicious and easy to make. I love this idea of cooking everything in just one pan! Saves the dishes and also melds the flavors together better! This seems like a quick, healthy and flavorful dish to whip up midweek. I'll need to give it a try. Congrats on the 10 year anniversary, too! It's food like this that makes me happy! Man, I can eat my weight in it! Thank you!! Corn, tomatoes, and lemon with salt and pepper are one of my favorite salads, add salmon and bake and you have a perfect meal!